Are you planning to start Trail Running in the New Year? 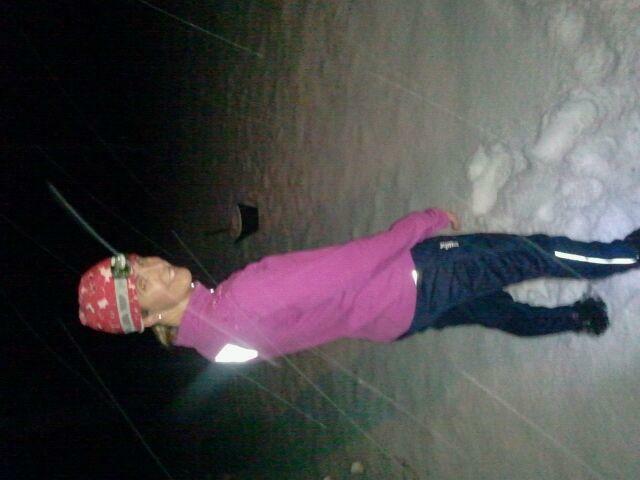 If you are like me you will be running on the trails even in the snow. In order to be ready for trail running here is my Holiday Gift Guide for Trail Runners for you and the special runnerds in your life. 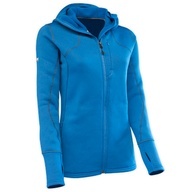 This is one of the best purchases of #fitgear I ever made to wear when trail running. First and most importantly this top has thumb-holes so you can cozy up and prevent drafts from dancing up your sleeves when you are running. The EMS power stretch fleece fabric is so warm on the inside and is also great for moisture wicking. I also love the hood which also offers protection to your neck and face against the wind when the temperatures dip below zero and the wind is blowing snow in your face. Under Armour ColdGear compression tights are my absolute favorite! I love the fit! The compression style helps to keep your muscles feeling strong and they are incredibly warm. I wore my ColdGear all last winter at the Winter Wild Mountain Race Series running in the snow and they were perfect for keeping me warm and dry. I love the easy close lace adjustment (Quick-lace) on this trail shoe. Plus these women’s trail running shoes are Gore Tex so completely waterproof which is perfect for trail running in the snow and running up mountain ski trails. The tread on these shoes is rugged and handles the roots and rocks of the New Hampshire Trails. These women’s trail running shoes are surprisingly light too which is nice when trying to navigate the trails in deep snow. 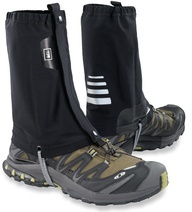 I have tall gaiters but have been wishing for a shorter pair for trail running to help prevent rocks/pebbles and snow from getting in my trail running shoes. I recently borrowed these from a friend and loved them. They are very easy to put on and are made of a nice stretchy fabric that moves with you as you take your strides. Kahtoola MICROspikes are a must-have for winter trail running. When the trails are extra gnarly and covered with snow and ice the MICROspikes will give you the extra traction that you need to help prevent a total “yard sale (tumble) on the trail when things get slip. 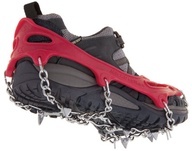 These MICROSPIKES have a great flexible crampon with flexible over the shoe binding. What makes these the best traction system for winter trail running is that they are easy to store in a pocket or as I like to do, bungee them onto my Camelbak which means you can can get the added traction right when you need it. I wore the Kahtoola MICROspikes last winter as I raced up and down mountains at the Winter Wild Mountain Running series in NH and the were amazing (I didn’t wipe out at all!) and made me feel very stable as I ran (somewhat out of control) down the mountain ski trails. When you are not trail running and your driveway has turned into a nightmarish ice skating rink your microspikes will save you from landing on your rear! 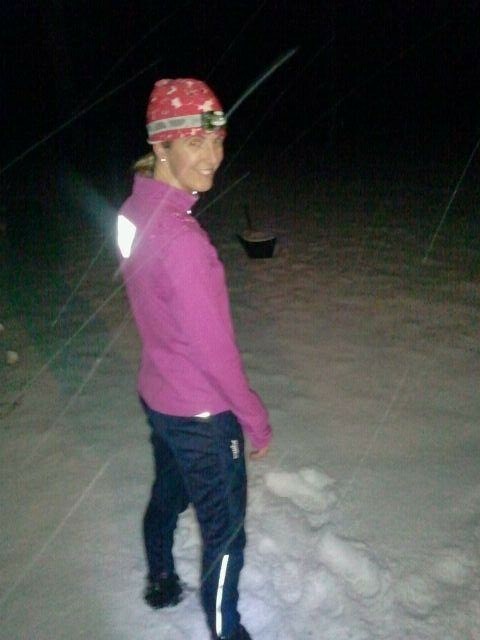 Winter Trail Running at Night-LOVE! My trail running experience is pretty weak…had no idea all the great gear available! Thanks so much for the mention! Love the blog love! Haha! And you’re list is awesome! Those micro spikes look pretty serious! Of course Sarah! How were the holidays with the new baby? Such a wonderful time! Thanks for checking out my list. Happy running! The XA Pros are some of the best running/cycling/all-around-adventuring winter shoes I have ever used. Combined with Microspikes and quality gaiters I am invincible from the shin down!! 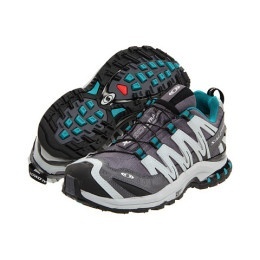 I love these shoes for hiking and especially winter trail running! Thanks for stopping by and hopefully you’ve been having some awesome winter adventures. I am looking forward to the start of the Winter Wild Race Series . . . http://www.winterwild.com. You should check it out! Sure thing Angela! I hope you had a wonderful holiday with your family. It would be awesome to meet up with you for some trail running sometime!!!! Thanks for the link love 🙂 Much appreciated it! I love your list, wish I could do more trail running but its hard since I live in Brooklyn. Some day though!! Looks great! Sure thing! I hope that you had a great holiday and found some time to squeeze in some running. Do you have any big races planned for this year? One of my friends has Dirty Girl Gaiters in a cute honeycomb pattern. I may have to check them out! Thanks Julie!